What Are Some Common Causes Of Depression? There are many common causes of depression. Depression is a very serious condition affecting millions of people. While there is some debate in the medical community as to what exactly causes depression, there are some common causes that the majority will agree upon. What are some of the factors that may cause depression? There is no real one single factor that causes depression. A traumatic early life experience, environmental issues, and a person’s genetic makeup can all be factors and causes of depression. Habits and experiences that make up a person’s lifestyle, a person’s social support (or a lack of it) should also be taken into consideration when trying to determine the causes of depression. Something that can cause someone to fall into the depths of depression often will have zero effect on someone else. A huge factor that causes depression is being disconnected from those around you. Feeling connected to others is a fabulous way to be able to deal with the daily stresses of life without letting them overcome you with feelings of depression. When this connection is lost, feelings of isolation result. In addition, traumatic life experiences can be causes of depression. 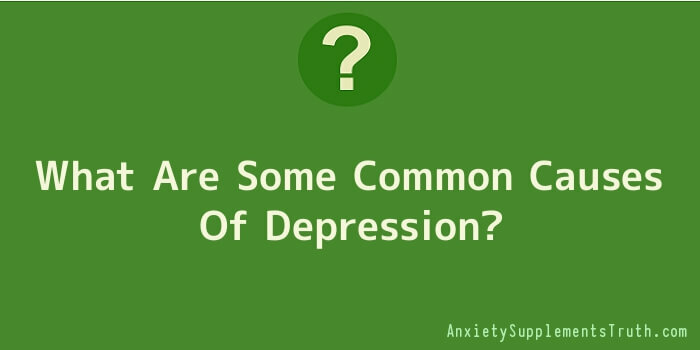 Many of the following circumstances can cause a person to fall into a deep depression. • Family violence no matter what your age can most definitely lead to depression. Many that have experienced any type of this abuse are lead to begin using drugs or alcohol. This is often blamed as factors that cause depression. However, there are often debates as to whether using substances to control feelings causes depression, or whether the horrible effects of these substances is among other causes of depression. • Experiences that can undermine a person’s self-confidence can be something that causes depression. Examples of this can be homelessness or poverty anything that would cause feelings of shame and embarrassment. • Extremely stressful situations such as the loss of a loved one or financial issues like bankruptcy can also be factors and causes of depression. Why exactly traumatic events can be considered causes of depression is debated. There is a connection established between stress and the reaction of brain chemicals, or neurotransmitters. If these transmitters do not work properly, one will most likely suffer the eventual onset of depression. Having to deal with unresolved trauma, such as seeing something shocking or experiencing abusive behaviour that makes you feel isolated, has been known to bring about chemical changes in the brain. These are common causes of depression. What are some treatment options for a something that causes depression? Something that causes depression can impair several functions of the brain, such as those functions that support motivation and energy. Because depression can be a very complex condition, it often needs several different treatments in order to be properly dealt with. Those seeking help from what causes depression in their life need to (often with the help of others), find what is going to work the best for them. First, those getting beginning treatment for depression need to be examined by their healthcare provider so they can receive a good diagnostic evaluation. An excellent evaluation needs to include what may be among the causes of depression, and what can be done to deal with them. A lot of the time, a combination of treatments is the best possible way to fight anything that causes depression. The following treatments have all been found effective in the treatment of depression. • Talk therapy can be used to help change negative behaviour patterns. • Medical treatment for depression generally involves administering antidepressant medications. • Electroconvulsive therapy can be helpful to those suffering from depressions that have trouble with taking medications. • Herbal treatments have also been found to be helpful is treating any factor that causes depression.